1 - farming scenes - ploughing scenes, a priest making offerings to Panehsy and his wife and a tree goddess giving food and drink to Panehsy (see below). 2 - Panehsy and his wife stand before Osiris. 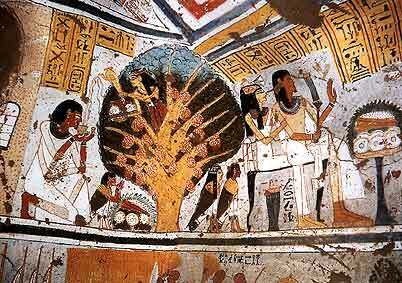 and scenes showing a festival in honour of Amenhotep I (a festival in which Paneshy was involved in a official manner). 3 - Paneshy and his wife make offerings before Amenhotep I, Panehsy and his wife adoring Amenhotep I and Queen Ahmose-Nefertari. 4 - Paneshy makes a libation and sacrifice at the gate and pylons of a temple. 5 - Unfinished funeral scenes (showing Panehsy's funeral bier being dragged towards the tomb).